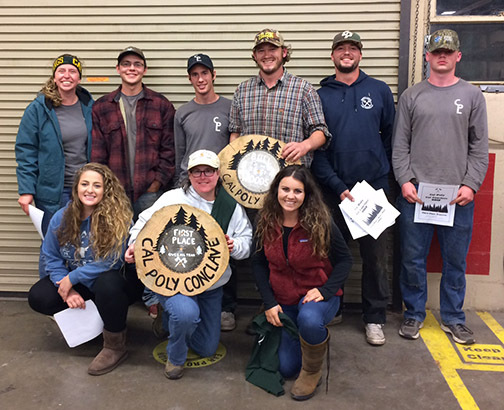 SAN LUIS OBISPO — Cal Poly’s logging team, an intercollegiate team of male and female students involved in traditional forestry field skills, won first place at the Cal Conclave collegiate logging competition held Nov. 4 at Cal Poly. Twenty-four Cal Poly students competed in three teams of eight, based on a combination of ability, improvement and commitment to the competition. Professor Samantha Gill is the team’s advisor. Teams from Humboldt State University, UC Berkeley and Northern Arizona University also competed at the all-day Cal Conclave, with a team from Northern Arizona University placing second and a team from Humboldt placing third. Events included tree climbing, power saw (chainsaw), single and double buck with cross cut saws, obstacle pole, choker setting and more. Cal Poly will host the 79th annual Association of Western Forestry Clubs Logging Sports Conclave, the largest annual collegiate competition of its kind, in spring 2018. Cal Poly Logging Team A took first place at the Cal Conclave on Nov. 4. Pictured, from left to right in the top row: Vanessa Shevlin, Kyle Rozell, Ian Wilson, Will Kraemer, Clark Hunter and Remy Winters. In the bottom row, from left to right: Erin Delany, Professor Samantha Gill and Rachel Wehrman. Cal Poly is a nationally ranked, comprehensive polytechnic university. The university’s College of Agriculture, Food and Environmental Sciences (www.cafes.calpoly.edu) is comprised of expert faculty members who take pride in their ability to transform academically motivated students into innovative professionals ready to solve the complex challenges associated with feeding the world in sustainable ways. Students have access to state-of-the-art laboratories, including ranch land, orchards, vineyards and forests, all of which provide the basis for Cal Poly’s Learn by Doing methodology. It is the fifth-largest college of agriculture in the country, with 4,000 undergraduate students.